Kale is an incredibly versatile green. It blends well into soups, can be used in salads or sautéed on top of the stove with a variety of dishes. It simply adds freshness, flavor and nutrition to everything. This recipe is very simple and easy to prepare. We prefer organic greens in our recipes due to insecticide residues that cover a larger surface area of the plant, as it is a leaf. 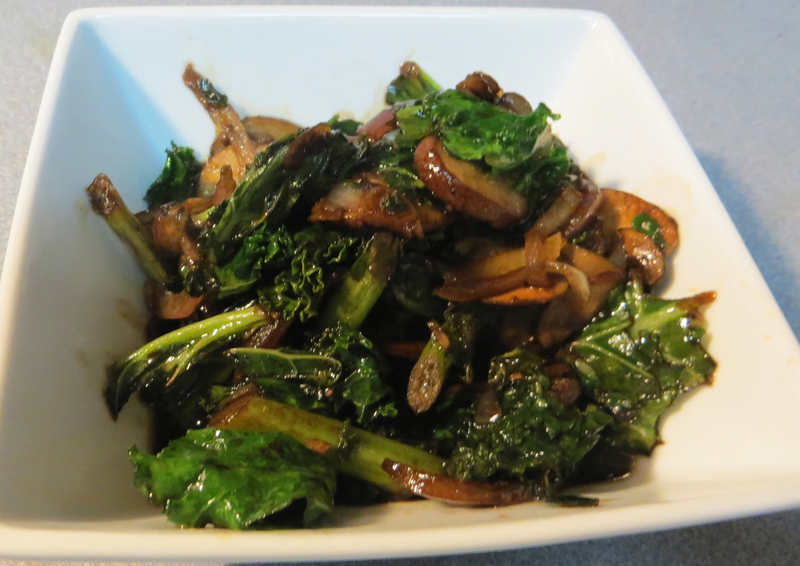 Enjoy this recipe with the kale alone or with the red onion and mushrooms for variety. One serving equals 1 cup cooked vegetables and 1/2 serving of fat. Rinse the kale in cold water to remove any grit. Fold the leaf in half, tearing it away from the large part of the stem. Tear the leaf into chunks. Heat oil in a large skillet over medium-high heat. Add red onion and mushrooms, sautéing until nicely softened and brown. Add garlic, stirring quickly to avoid burning, and sauté 2 minutes. Add kale, salt, pepper and crushed red pepper, sautéing until just wilted or to desired texture.